Solar PV Glass Market size for 2016 was valued over USD 2 billion and is set to exceed 700-million-meter square by 2024. Stringent policies and regulations pertaining to clean energy adoption coupled with laws to curb Greenhouse Gas (GHG) emissions will boost the global solar PV glass market size. Favorable government initiatives to encourage the adoption of sustainable energy for building envelopes will positively influence the industry outlook. In 2015, the U.S. government introduced Executive Order (EO) 13693 to plan the Federal Sustainability and cut the GHG emissions up to 40% from 2008 levels over the next decade. The policy also directs to utilize renewable electric energy for 30% of the total building electricity use by 2025. Growing investments to explore the untapped photovoltaic potential among developing countries including India, Algeria, Jordan, Chile, Nigeria and Argentina will further stimulate the solar PV glass market growth. In 2016, Argentina Ministry of Energy announced the establishment of 58 PV projects with combined capacity of 2,834 MW under RenovAr program. The Government of Jordan is working aggressively to add to 300 to 600 MW of photovoltaic capacity by 2020. Positive outlook towards renewable industry along with introduction of subsidies and rebates will fuel the solar PV glass market growth. The levelized cost of new PV plants in the U.S. have decreased significantly over years owing to Investment Tax Credit (ITC) policy of the country. In October 2016, the U.S. Energy Information Administration (EIA) reported that the country had a total installation of 12.6 GW of small scale solar photovoltaic systems majority of which falls under residential sector. Easy manufacturing process, uniform thickness, architectural applications, and cost effectiveness are some of the key qualities which will drive float solar PV glass market size. The technology on account of its high light transmittance, low reflectance and high flatness holds extensive applications in thin film photovoltaic modules. Pattern solar PV glass market share is projected to witness gain over 6% by 2024. Non-smooth surface and impressed patterns makes its adoption preferable among crystalline and CIGS photovoltaic modules. These technologies provide a non-blinding effect, better aesthetics, desired transparency degree and easy laminations over modules. Annealed solar PV glass market in 2016 was over 300-million-meter square. The cost competitiveness, easy manufacturing process and easy availability of the product will stimulate the business landscape. These products are not heat strengthened and delivers easy cutting, edging, machining and polishing of the glass on panels. Toughened / tempered solar PV glass market is anticipated to witness growth over 7% by 2024 subjecting to its high resistance and effective safety edge features than other counterparts. Growing adoption of photovoltaic systems across residential applications will boost the product landscape. These products provide high mechanical strength and better thermal stress breakage. 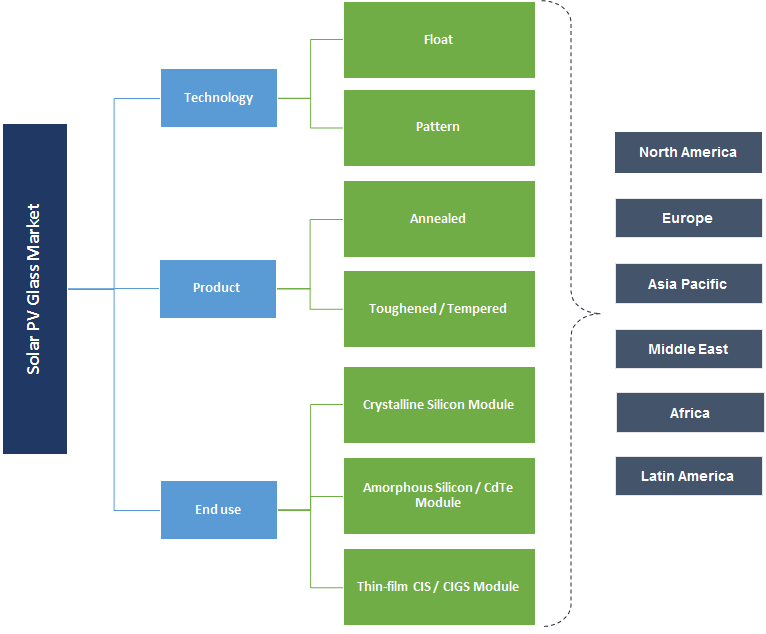 High efficiency and uncomplicated manufacturing processes will drive crystalline silicon module solar PV glass market. Low iron float and pattern glasses are primarily used in the manufacturing of the crystalline modules. In 2016, the International Renewable Energy Agency (IRENA) reported that over 60% of globally manufactured modules are crystalline silicon. 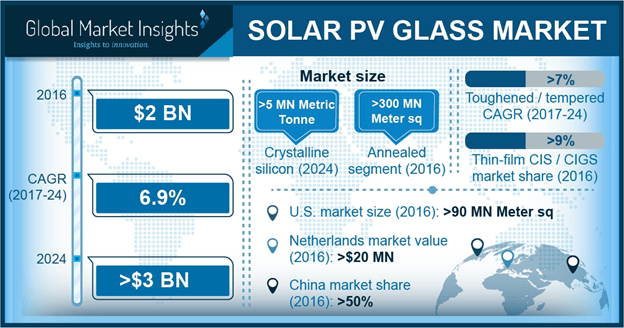 Thin-film CIS / CIGS in 2016 accounted for over 9% global solar PV glass market share. Growing measures to reduce the panel dimensions by subsequently improving efficiency index will positively enhance the business size. In September 2016, the Government of Queensland, Australia committed to support 150 MW of solar power generation to encourage new large scale projects in the region. U.S. solar PV glass market size in 2016 was over 90-million-meter square. Measures towards energy security along with stringent government regulations to deploy sustainable energy will propel the industry growth. In January 2017, the U.S. legislation introduced a Department of Energy Research and Innovation Act under H.R.589 to improve traditional laboratories and focus more towards the electricity storage and solar fuels research activities. China accounted for over 50% of the global solar PV glass market in 2016. The country stands as the major producer, exporter and consumer of photovoltaic systems and strives to conduct R&D initiatives to improve efficiency and costs of panels. In December 2016, the government revised Thirteenth Five Year Plan to develop country’s photovoltaic energy sector. It aims to achieve large scale production of crystalline silicon photovoltaic cells with efficiency of at least 23% by 2020. Stringent government regulations against carbon emissions along with ongoing government program towards rooftop installation will fuel UK solar PV glass market. In 2016, the government of UK announced to completely phase-out the existing coal fired stations by 2025. The government is primarily aiming to adopt PV for generation and abolish polluting fossil fuel usage. Chile solar PV glass market is projected to grow over 10% by 2024. Untapped potential along with rising investments in photovoltaic module installation will positively impact the country’s industry size. In May 2016, Enel Green Power Chile Ltda. has completed the country’s largest photovoltaic project. The company invested USD 270 million to develop a 160 MW project which can generate over 400 GWh per year. Key companies operating in the solar PV glass market include Onyx, Nippon, Guardian Industries, Xinyi, Saint Gobain, AGC, Guangdong Golden, Borosil, Sunarc Technology, Sisecam Group, Euro Multivision India, Hecker Glastechnik, Flat Group, Interfloat Corporation, Jin Jing Group and Vidur Glass. Global industry competitors tend to witness mergers, acquisition and joint ventures to enhance their trade penetration across different regions. In February 2017, Sisecam group announced to invest USD 112.5 million to build a glass fibre plant in Turkey with an annual production capacity of 70,000 metric tons. The aim of the company is to enhance its product portfolio and persist to be reliable supplier of the respective products. Photovoltaic glass is integrated with solar cells to concentrate sunlight and convert solar energy to electricity. Semiconductors and photovoltaic cells are embedded between the sheets of glass which is employed on the modules. It constitutes for over 80% of the module by weight and works as the prime interaction between module and light. Sometimes an additional plastic anti-reflective sheet or coating is applied to enhance the effect of glass cover to generate electricity, prevent UV radiations, endure extreme temperature conditions and provide anticipated transparency.